, in Latin Larroquanus, whom Bayle styles one of the most illustrious ministers the | reformed ever had in France, was born at Leirac, a small city of Guienne, near Agen, in 1619. He was hardly past his youth when he lost his father and mother, who were persons of rank and character. This misfortune was soon ifol lowed by the loss of his whole patrimony, although by what means is not known; but the effect was to animate him more strongly to his studies, and to add to polite literature, which he had already learned, the knowledge of philosophy, and above all, that of divinity. He made a considerable progress in these sciences, and was admitted a minister with great applause. 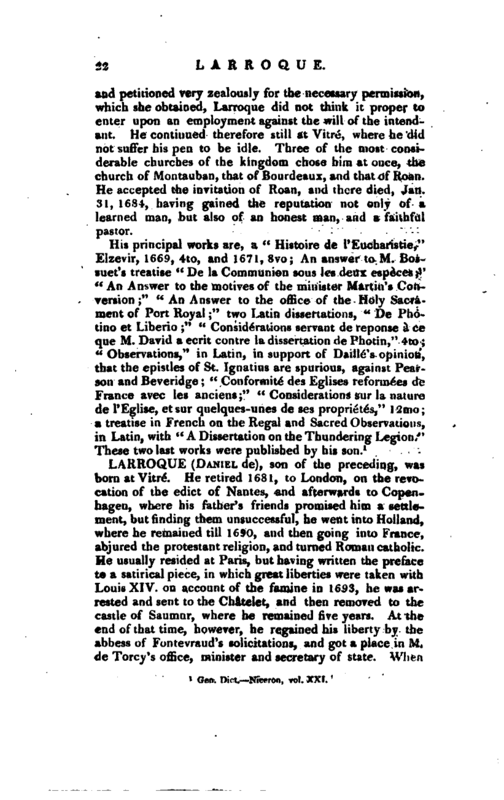 Two years after he had been admitted in his office he was obliged to go to Paris to answer the cavils of those who intended to ruin his church, in which, although he was not successful, he met with such circumstances as proved favourable to him. He preached sometimes at Charenton, and was so well liked by the duchess de la Tremouille, that she appointed him minister of the church of Vitre, in Britany, and gave him afterwards a great many proofs of her esteem; nor was he less respected by the prince and princess of Tarente, and the duchess of Weimar. He served that church about twenty-seven years, and studied the ancient fathers with the utmost application. He gave very soon public proofs of the progress he had made in that study, for the answer he published to the motives which an opponent had alledged for his conversion to popery, abounded with passages quoted from the fathers, and the works which he published afterwards raised his reputation greatly. There was an intimate friendship between him and Messieurs Daille, father and son, which was kept up by a constant literary correspondence; and the journey he took to Paris procured him the acquaintance of several illustrious men of letters. The church of Charenton wished to have invited him in 1669, but his enemies had so prepossessed the court against him, that his majesty sent a prohibition to that church not to think of calling him, notwithstanding the deputy general of the reformed had offered to answer for Mods, de Larroque’s good behaviour. 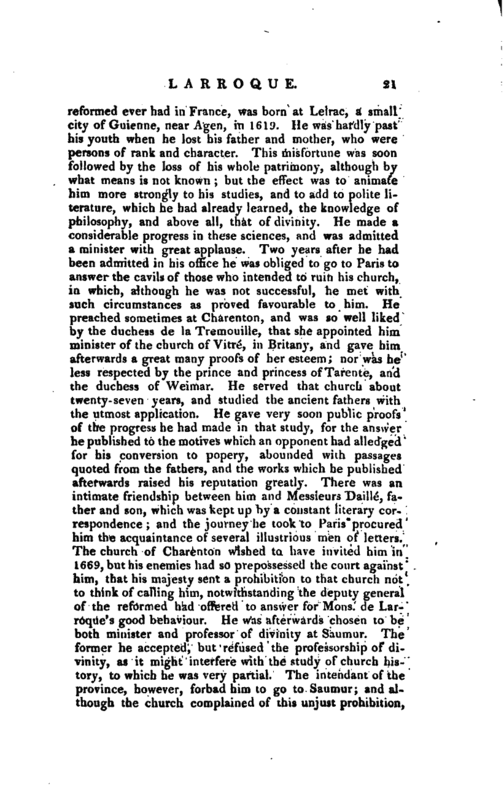 He was afterwards chosen to be both minister and professor of divinity at Saumur. The former he accepted, but refused the professorship of divinity, as it might interfere with the study of church history, to ttfhich he was very partial. 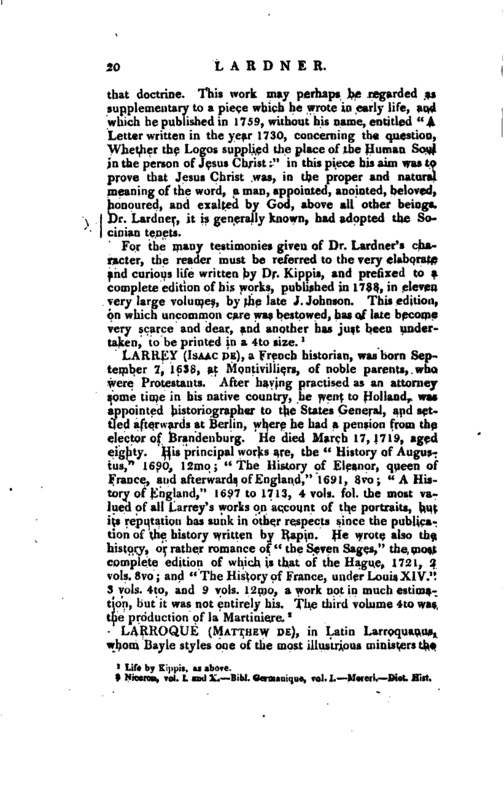 The intendant of the province, however, forbad him to go to Saumur; and although the church complained of this unjust prohibition, | and petitoned very zealously for the necessary permission, which she obtained, Larroquc did not think it proper to enter upon an employment against the will of the intendant. He continued therefore still at Vitré, where he did not suffer his pen to be idle. Three of the most considerable churches of the kingdom chose him at once, the church of Moutauban, that of Bourdeaux, and thut of Roan. He accepted the invitation of Roan, and there died, Jan. 31, 1684, having gained the reputation not only of a learned man, but also of an honest man, and a faithful pastor.